Tommy McCarthy of the Boston Beaneaters was one of the smartest players in baseball. The outfielder with the “smooth face and boyish smile” was quick thinking, “fast on his feet,” and “game to the core.”1 The Pittsburgh Pirates were victims of his astute play on Wednesday, August 15, 1894, at the South End Grounds in Boston. The Beaneaters won the 1893 National League pennant by five games over the second-place Pirates and were in first place on August 15, 1894. 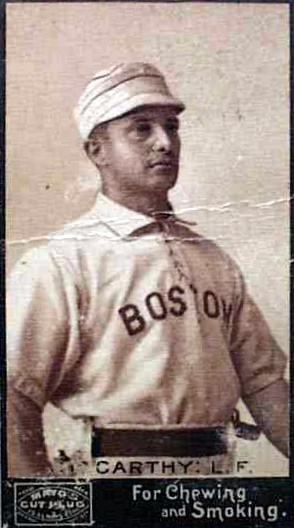 However, the team had lost two key players to injuries – center fielder Hugh Duffy and shortstop Herman Long – which forced manager Frank Selee to press two rookies into service. McCarthy moved from left field to center field to accommodate 22-year-old Fred Tenney in left. Meanwhile, rookie Frank Connaughton replaced Long at shortstop. Tenney and Connaughton served as the team’s backup catchers. Right-handers Jack Stivetts of the Beaneaters and Red Ehret of the Pirates started on the mound. Their batterymates were Charlie Ganzel and Billy Merritt, respectively. Merritt was a backup catcher to Connie Mack, who had the day off. Another backup catcher, Joe Sugden, filled in for injured Pirates shortstop Jack Glasscock. Teams carried few extra men in these days. Players had to be versatile. Attendance was reported to be 2,172. The Pirates scored twice in the first inning: Elmer Smith doubled and came home when Tenney muffed Jake Stenzel’s long fly ball, while Lou Bierbauer’s single to right field scored Stenzel. The Pirates added two more runs in the third inning, on Stenzel’s two-run homer over the left-field fence. The Beaneaters got one back in the bottom of the third. Ganzel singled, and Stivetts, one of the game’s best-hitting pitchers, rapped a base hit that got by Stenzel in center field. It was a close play at the plate; Ganzel scored when Merritt dropped the ball. Stivetts tagged up at third base as Smith caught Bobby Lowe’s fly ball on the foul line near the left-field fence and hurled it 250 feet to home plate.2 This time, Merritt hung on and Stivetts was called out. The Beaneaters scored another run in the fifth inning, on Jimmy Bannon’s double and Lowe’s single. In the top of the sixth, Stenzel walloped a solo home run, his second of the game, again over the left-field fence. Meanwhile, rain came down hard; umpires Bob Emslie and Will Hoagland told the teams to keep playing. Tenney led off the bottom of the sixth with a double to left. McCarthy drove him in with a double to center field. Tommy Tucker’s single scored McCarthy. The Pirates led 5-4 after six innings. Merritt lifted a high popup into shallow center field. McCarthy called for the ball and was prepared to catch it, but he deliberately let it hit the ground and grabbed it on the first bounce. He fired the ball to Lowe at second base who turned a double play by tagging Sugden and stepping on the bag for a force out of Hartman. It was so fast that it took a moment for umpires, players, and fans to realize what had happened. Infielders Nash and Tucker were confused and chased Sugden and Hartman on the basepaths, though they were already out. Recognizing there was one man still to get, McCarthy raced to the infield, called for the ball, and ran toward Merritt who was standing at home plate in a daze. When he saw McCarthy coming, he began to run, but Ganzel held him in a bear hug as McCarthy applied the tag. It was a triple play, or perhaps, a “traple” play. What McCarthy executed is known as the trapped-ball play. The infield fly rule, adopted at the beginning of the 1894 season,4 prohibits this play on infield flies, but the rule does not apply to fly balls to the outfield. The Beaneaters did not score in the bottom of the ninth, and the game went to extra innings. Both teams went out in order in the 10th inning, as Stivetts and Ehret continued their fine work. In the top of the 11th, Stivetts struck out Jake Beckley and was helped by two defensive gems: Ganzel made a running catch of Stenzel’s popup and Bannon robbed Bierbauer of extra bases with a spectacular grab in right field. The author relied on the game descriptions appearing in the August 16, 1894, issues of the Boston Globe, Boston Post, and Pittsburgh Commercial Gazette. 1 Boston Globe, August 30, 1894. 2 Philip J. Lowry, Green Cathedrals (Reading, Massachusetts: Addison-Wesley, 1992), 109. 3 Boston Post and Pittsburgh Post, August 16, 1894. 4 Peter Morris, A Game of Inches: The Stories Behind the Innovations That Shaped Baseball (Chicago: Ivan R. Dee, 2010), 164.